Wounds are a gateway for microorganisms. For this reason it is important to know the wound healing stages, how to clean and close them to avoid complications. As a general rule, wounds are damages that can occur on the external surface of our body. It can also be defined as a loss in the continuity of the skin due to an external factor. According to the characteristics of the wound, the medical team can choose to encourage its closure or not. 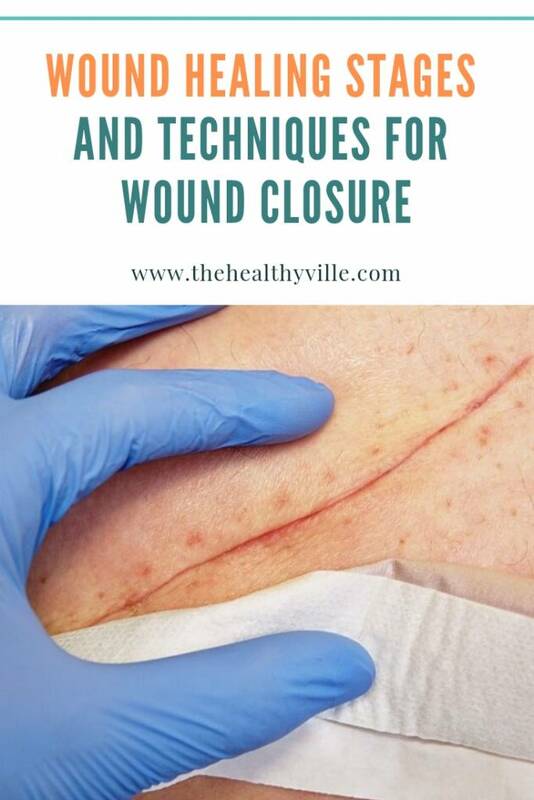 Currently, one of the techniques that is most used in wound closure is the use of sutures. Within this method there are numerous variants and the corresponding doctor must choose the most appropriate for the wound presented by the patient. After a wound, physiological processes are activated in phases to carry out their regeneration. One of the properties that should be checked is the cleaning that shows the wound. On the one hand, clean lesions are recent and not contaminated or infected. On the other hand, dirty wounds may be later, appear with more torn tissue with foreign bodies in them. Another classification of wounds can be determined from the agent or cause of the injury (gun, fire, etc.). Also, they can be differentiated according to their appearance, if it affects other structures apart from the skin, etc., among other classifications. Inflammation phase. It is one of the wound healing stages doctors call reaction phase and appears during the first days. In it, blood vessels dilate and vascular permeability increases. In this way, serous fluid is filtered and the leukocytes form a protective layer (crust). Proliferation phase. Other names that the second of the wound healing stages receives are the regeneration phase and the granulation phase. It begins 3 days after the injury and ends 1 to 2 weeks later. The lost collagen begins to be produced and the lymphatic and blood vessels are recovered. Maturation phase. The last one of the wound healing stages is the stage of wound remodeling. It begins a few weeks after receiving the damage and ends up several years later. In it, the scar diminishes its depth and size. Finally, the patient will present a paler color area where the injury occurred. Depending on the characteristics of the wound, the medical team will use different suture techniques. In any case, the group of specialists should follow the general procedure when treating wounds. They should make a list of priorities in case of accident or emergency with other alterations. First, the patient must be anesthetized to reduce the discomfort associated with wound closure. It can be administered locally or general, depending on the severity of the injury. To do this, one or more medications are injected into the patient, such as lidocaine. Next, the group of specialists will carefully and gently remove the foreign bodies that may be found inside the wound. For this, the most appropriate and sterilized instruments will be used. Later, an abundant amount of physiological saline should be applied in the area to clean it properly. Approach points. It consists of a set of tape sections that keep the ends of the wound near. As a general rule, you can remove them within a few days of their placement naturally. Staples. These are small metallic threads with the shape of a staple, which keep the wound and its edges firm to promote the healing and regeneration of tissue. You must remove them using a special medical instrument. Sutures of thread. There is a great variety of knots and types of threads that the group of specialists can use depending on the tissue and shape of the wound. In this way, you need to use a needle to sew the entire extent of the lesion. Don’t forget to SHARE the wound healing stages and techniques for closure with your friends and family on your social networks!